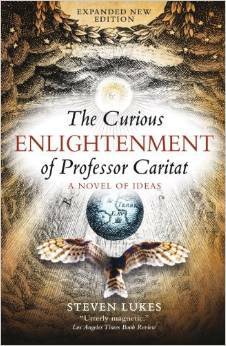 By turns witty and profound, The Curious Enlightenment of Professor Caritat: A Novel of Ideas (the title itself is a pun), is overflowing with good things. Caritat, a professor of the Enlightenment, is imprisoned in his home state of Militaria for the dangerous crime of spreading optimism. Sprung from prison by a former student, Justin, he is recruited by the guerrilla resistance group, the Visible Hand, to wander a fantastical domain in search of grounds for optimism and the best of all possible worlds. Caritat travels through a range of ideologically-driven states, and many readers will recognise not only numerous strands of modern Western political thought but also the satirical caricatures of Reaganite America, Thatcherite Britain (although the predictable appearance of the phrase ´there is no such thing as society´ is somewhat disingenuously taken literally) and the former Soviet Union. In each state Caritat finds aspects of its organisation and ideals worthy of admiration but each also has grave weaknesses when measured against Enlightenment ideals which are increasingly exposed through Caritat´s experiences and his internal dialogue with Western thinkers. Clearly modelled on Voltaire´s Candide, reminiscent of Gulliver´s Travels and adopting an approach to political discourse similar to Orwell´s Animal Farm, one might be tempted to think that Lukes novel is so rich in intertextuality that it is a ´difficult read’. Not so. Lukes´style is so fluid, his story-telling so light-handed (most of the time), so elegant, that even the most novice reader is carried through Professor Caritat´s adventures as skis glide over snow: the pages just keep turning. If the novel has one disappointment, it is the apparently casual analysis given to the Marxist Utopia in comparison to the more satirical treatment accorded to some other political philosophies. Dismissed lightly as no more than an impossible dream, Marx and Engels avoid the acute criticism which Lukes levels at others – in particular the Utilitarians, Jeremy Bentham and John Stuart Mill. There are other flaws too – the ending seems ham-fisted and abrupt in the comparison with the lyrical nature of earlier episodes and the characterisation of Professor Caritat´s constantly off-stage children appears pointless: Justin provides sufficient audience for all Caritat´s musings. Nevertheless, the Curious Enlightenment of Professor Caritat is an entertaining and – with apologies – an Enlightening read: a readable travelogue of western political theory. Read and reviewed in 2007.